Did Google affect how I search on search engines? I use Google in 99.9% of my searches on internet. I use it so often, that sometimes it’s just to the URL of a site I know very well, but I can’t spell the address or do not recall exactly (I can never spell the URL of delicious, for example). I have to say that I’m pretty satisfied with the results and most of the times I find what I am looking for within the first 3-5 results. This could be simply because Google is good, isn’t this the reason why we all use it? Nevertheless, from time to time I try other search engines such as Ask or Yahoo! and hardly find better results. I’d say that on an average I find worse results. Still, I have friends who use Ask or Yahoo! and say they are much better. Of course, search engines should return the best result not matter what, but if my keywords are not “natural”, but adapted to the approach Google has to content, then it’s not the search engine that is wrong (maybe). So how can I objectively judge the quality of the results? Also, won’t the quality of results always be subjective? If you read the blog post on the official Google Blog entitled Yahoo! and the future of the Internet you might think Google is not so happy that Microsoft might buy Yahoo!. 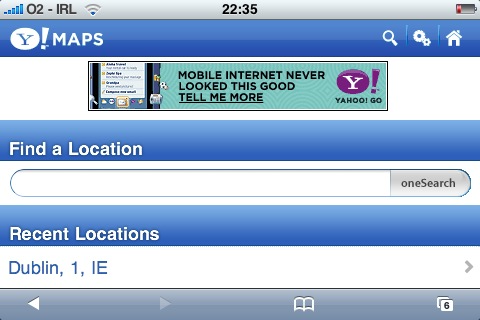 I took a look at the Beta version of the new mobile version of Yahoo!. I tested on an iPhone and I have to say that I really like the design and functionality. When you’re logged in with your account you get e-mails, your selected news and so on. Pretty good. 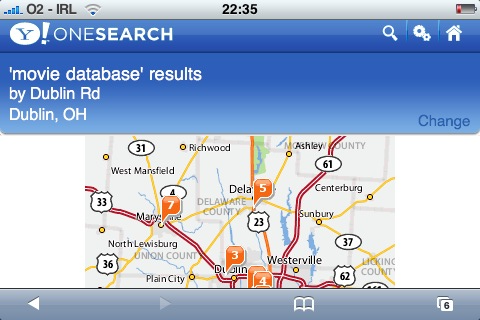 Too bad that when checking for cinemas it “moved” my location to Dublin, Ohio!! I’ve never been to Ohio, but I’m sure Dublin must be a nice town, just not where I was. It’s OK, it’s a Beta, you don’t expect everything to be perfect. I was positively surprised it recognized Dublin in Ireland in the first place, so I expected it to support any location. I really look forward for the worldwide release of the new mobile site, looks very promising. The interface was clearly very optimized for the iPhone, using the style to show buttons on top of the page and so on. I’ll need to test on some other mobile device, maybe lower end.